This October the Academy of St Thomas celebrates its 45th Anniversary of high calibre music-making in Norwich with a new guest conductor and talented soloist. Equally at home in the concert hall, recording studio, or working in the world’s leading opera houses, Ben has huge experience of all genres of music. Ben has conducted orchestras all over the world and is a highly experienced conductor of ballet. He is also a prolific composer and has written music for feature film, short film, television, radio, the stage and the concert hall. As a Music Director in the studio, Ben has a large number of credits including conducting the BAFTA award-winning and EMMY nominated soundtracks for the BBC flagship series “Walking With Dinosaurs” and “Walking With Beasts” which also feature Ben’s orchestrations. Additionally, Ben has worked on many of the most successful television series, and has worked as an arranger/conductor for an array of pop and jazz performers. Since his critically acclaimed concerto debut at the age of ten, the award-winning English ‘cellist Richard Harwood has performed concerti and chamber music in major venues. A widely experienced performer, Richard has played concertos with many leading orchestras all over the world and is also a busy chamber music musician. Richard is regularly heard on BBC, having made his BBC Radio 3 debut at the age of thirteen with a live recording of the Elgar Concerto. He has also given live performances on other radio networks including Classic FM, Radio France, MDR, RTÉ and Radio New Zealand and has recently been appointed principal cellist of the Royal Philharmonic Orchestra. 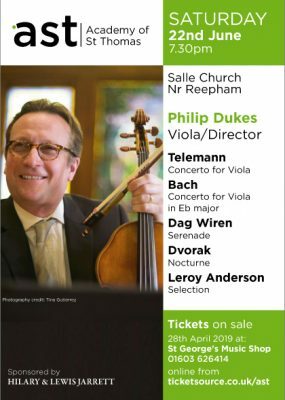 So don’t miss this opportunity to hear ever-popular Elgar Cello Concerto, well-known for its lilting themes and atmospheric slow movement performed by Richard. Brahms’ epic Symphony No 4 forms the second half and will be played with the chamber orchestral forces that it was written for thus ideally suiting the Academy of St Thomas. Delius’s most famous work, The Walk to the Paradise Gardens from his opera Romeo and Juliet begins this programme.